YOUR RESPONSIBILITY:When shipping sometimes the ship will arrive at another entry port and then devanned especially for LCL cargo. Do not worry the goods will be then trucked to the destination port as written in your quote. Some senders have been told they have to pay extra in the receiving country but this is not true. Our job in Thiland is to make sure the goods your are sending arrive safely in the destination port and we make every effort to make sure. However there have been instances when goods go in a rounf about travel route but this is the shipping line (ship) route which we cannot change. We send FOB (free on board the ship) or CIF (Cost insurance and freight) or CF (Cost, freight).Once the shipment reaches its destination port then we are not responsible. FREIGHT CARTAGE IN PICKUPS & TRUCKS CARTAGE CHIANGMAI- Chiangrai / BANGKOK--to Chiangmai, Chiangrai /Hua Hin- Bangkok and Chiangmai /Pattaya to Bangkok and Chiangmai / INCLUDES RETURN OR BOTH WAYS EITHER WAY. Let us take your goods to Bangkok. We have trucks leaving every few weeks for Bangkok, Chiangmai, Hua Hin, Pattaya and we specialize in foreigners belongings whether shifting or LCL loads to ship home your personals and we pack in Bangkok at our depot cheaper than Chiangmai rates and companies. This is overseen by our foreign manager and we can deliver door to door in Bangkok or Chiangmai, Pattaya, Hua Hin and towns on the way. This is a new service due top the fact past Freight companies we have used have damaged goods and theres no return. Get a quote and see if we can better it. 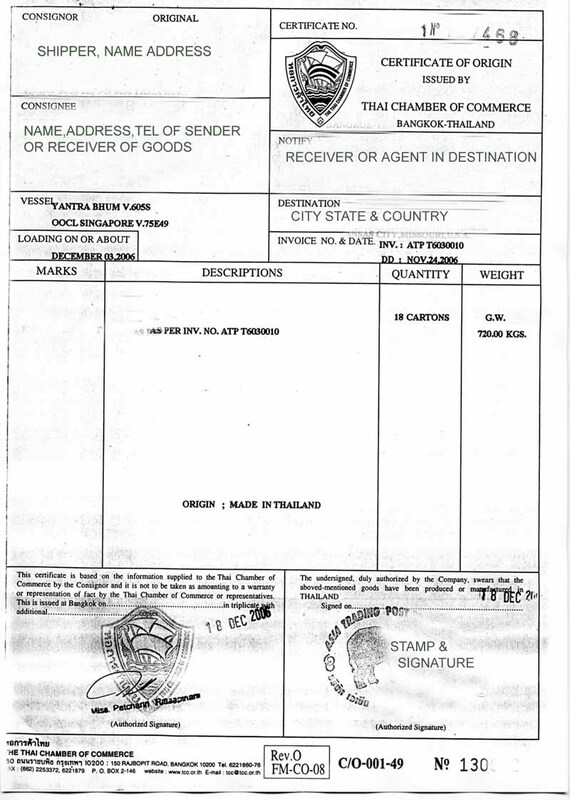 AIRWAY BILL CHECK TRACKING AIR WAY BILL HERE: http://www.thaicargo.com/services.aspCLEARING YOUR GOODS BACK HOME: Sometimes it is easier to have a clearing agent to clear your goods and pay the duties for your goods coming in. They will even truck to your door but they will handle your full shipment. They will save you the hassles etc of getting the goods direct to you thru customs and Agriculture depts. You can contact these agents in your country but have a look at our agents, See our worldwide customs clearing agents [ Customs clearing agents ].